Saudi Arabia has invested $3.5 billion in Uber. Prince Alaweed bin Talal has invested hundreds of millions in Snapchat, and according to some reports, Saudis have sunk billions in Elon Musk’s electric car maker Tesla. These are only a few of the American companies in which the Saudis have taken stakes. The investments in Silicon Valley are a good example of the Saudi approach to international relations: Ensure the silence of Western countries on human rights, and when there’s a need to recruit fighters from an African country, write a check. But Saudi Arabia under Crown Prince Mohammed bin Salman is changing. The kingdom’s operations no longer happen behind the scenes, and the ramifications are being felt in the global balance of power. In addition to its huge investments in the West, Saudi Arabia has provided loans and aid to bail out regimes; this and control over global oil prices are the foundations of Saudi diplomacy. In this way, the kingdom has created debtor states that sometimes have to give something back. Such countries include Lebanon, which has enjoyed investments in the billions of dollars, and Egypt, which has become financially dependent on Riyadh. A partial list also includes Jordan, Sudan, Pakistan, the Philippines and Morocco. Saudi Arabia also employs millions of workers from Arab and Asian countries. But yes, the Saudis require something in return. In the same way Western countries are asked to ignore human rights abuses in the kingdom, Egypt was asked to hand over the Red Sea islands of Sanafir and Tiran. In 2002, Riyadh forced the Arab League to adopt Saudi King Abdullah’s initiative for Middle East peace. Another good example of the give-and-take is the coalition fighting Iranian-supported rebels in Yemen, a coalition that even includes distant Senegal. For decades, Saudi Arabia preferred to operate behind the scenes, not at the forefront of diplomatic or military campaigns (except during the 1991 Gulf War). Oil sales and giant business transactions ensured Saudi interests in the West. In the Middle East, Riyadh left the stage to countries such as Egypt or to the Arab League, which always knew what to do to promote Saudi positions. But after King Salman transferred the authority to run the country to his son Mohammed bin Salman earlier this decade, Saudi strategy changed markedly. Saudi Arabia now takes direct responsibility for its campaigns, many of them designed to block its strategic rival, Iran. The Middle East has thus become an arena of conflict in which Saudi Arabia is directly involved. Mohammed’s first move was a military campaign in Yemen that has yet to produce a victory, even though Riyadh has the best American weapons. In the war, kingdom has been excoriated for the deaths of thousands of civilians, many of them from hunger. Saudi Arabia’s direct involvement in these deaths, along with the murder of Saudi journalist Jamal Khashoggi last October, convinced the U.S. Senate to vote to end U.S. support for the Saudi-led coalition. Another instance of blatant Saudi intervention occurred at the end of 2017, when Mohammed instructed Lebanese Prime Minister Saad Hariri to resign in order to topple a government in which Hezbollah was a partner. Protests in Lebanon and abroad forced Riyadh to retract its demand. In the Syrian civil war, Saudi Arabia financed militias that failed to turn the tide. Saudi opposition to the rule of President Bashar Assad was stymied by the Russians and Iranians, forcing the Saudis to retreat from Syria. Their attempts to force Amman to let it attack Syria from Jordan failed after the Hashemite kingdom said it wouldn’t become a launching pad for attacks on Syria. In addition, Saudi Arabia initiated a boycott of Qatar a year and a half ago, but its coalition with Egypt, Bahrain and the United Arab Emirates didn’t affect the small, wealthy country, which only continues to prosper. Now, under American pressure, Saudi Arabia may lift these sanctions. So far, it seems Mohammed’s strategy has yet to benefit Saudi Arabia. 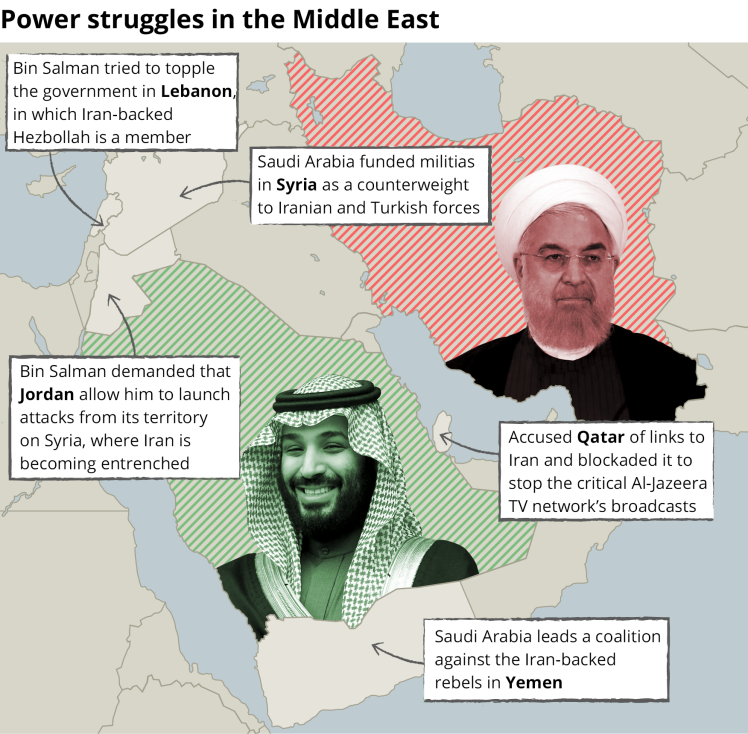 The failed transition from a country that pulls strings behind the scenes to one that spearheads campaigns has raised questions on whether Saudi Arabia had been overrated regarding its ability to dictate regional policies and rebuff Iran. Therein lies the damage Mohammed’s arrogance has caused his kingdom, à la the United States, which has also learned that wealth and financial assistance don’t guarantee support for policies. It’s now clear that the Saudi dilemma lies not just in whether Mohammed can remain in his post, or in limiting the harm he caused the kingdom with the Khashoggi affair. Riyadh now must craft a strategy that will restore its brand as a regional power.